Columbia, MD – June 19, 2018 – SolarWindow Technologies, Inc. (OTC: WNDW) today announced its latest commercial alliance with nTact, a global leader in coating process knowledge and equipment manufacturing, necessary for large-scale production of transparent electricity-generating windows. With over 90 patents and trademark filings, the company’s electricity-generating window and flexible glass products, currently under development, target the estimated 5 million commercial buildings and tall towers in the United States and millions more worldwide. “Our mandate is to bring SolarWindow™ electricity-generating products to the $100 billion global skyscraper and commercial buildings market,” stated Mr. John Conklin, President and CEO of SolarWindow Technologies, Inc.
To enable commercial production, SolarWindow first partnered with Triview Glass Industries, a glass fabrication plant, where its coatings can be applied to windows. SolarWindow subsequently entered into a collaboration with Raynergy Tek, a chemicals developer, to ensure a steady supply of raw materials used in its coatings. 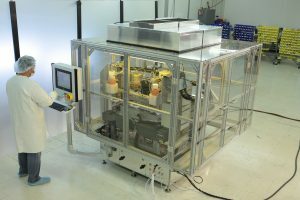 The alliance with nTact, announced today, provides specialty-coatings machinery needed for use in a high-volume SolarWindow production line at the plant. SolarWindow scientists and engineers will work with nTact to design, prototype, test, and manufacture machinery and equipment necessary for coating glass and flexible materials with the company’s transparent electricity-generating coatings, which will be used to create a manufacturing line, with the goal of implementing large-scale production of SolarWindow™ electricity-generating glass and flexible products. “We plan to use the methodologies, processes, and technologies required for large-scale coating created at nTact that, upon completion, would be shipped to Triview for incorporation into the SolarWindow production line,” explained Mr. Conklin. Triview manufactures a wide variety of architectural and specialty glass products and has entered into a Process Integration and Production Agreement with SolarWindow for the fabrication of SolarWindow™ products. Dallas-based nTact delivers equipment to Fortune 500 and Fortune 100 companies, with a focus on new technologies and emerging market applications. nTact is a global company with operations spanning the United States, United Kingdom, Germany, Japan, Korea, and China. Targeting commercial buildings, which consume almost 40% of all the electricity in the United States, the company’s transparent electricity-generating windows could reduce energy costs by up to 50% and achieve a one-year financial payback for building owners, the industry’s fastest financial return, according to independently-validated power and financial modeling.